I for the latest version, 7.15.2672, on SnapFiles and downloaded it. However, upon unzipping it and running the main app, my system immediately treat the theSage.exe as malware and erased it. I securely wiped the ZIP file, downloaded it again and extracted it, only to see Bandizip say "Access is denied(5)" the main app was erased again. I'm glad I have version 6.10.1816 on my desktop and version 7.8.2644 on my portable drive. Neither give me any problems. I might have paid for the advanced options if there was some indication as to what they are!! TheSage is now at 6.10.1816. Since your download link points to that version via TheSage home page you might as well update the entry here to reflect the current version number. Today I visited one of the thesaurus sites available on the internet that are overrun by ads, videos, and other impossibly goofy distractions. It was then that I was really happy I had The Sage, not just because it's not overloaded with junk, but because it's a superior resource for understanding meaning, related words, and opposites. It's like a tabbed web browser for the dictionary complete with bookmarks, wildcards, and more. I just installed version 5.1.1790, which is a public release that is now available on the author's website. The app is 100% portable, as long as that option is chosen during installation. All settings will be saved to the application folder, and you will not find an entry in the control panel's list of installed programs. Simply copy the entire folder to a USB drive to run it from there. There are a number of improvements to the GUI and the one-click lookup options, including extensions for compatibility with Firefox and Chrome. V4.0.1774 is free and portable. I tried Version 4.0 database 1774, and there's one definite bug in the online search tool: Several of the search engines, including Wikipedia, bring up a script error message when accessed through TheSage's internal browser window. If the same search engines are accessed externally in Internet Explorer there are no script errors reported. I've already contacted the author about this. Also, for those using wide screens, such as mine, which is 1024x600, the options dialogues will extend beyond the bottom of the screen and can't be resized. Unfortunately the "Apply" buttons are at the very bottom, and the only way to use them is to hide the Windows taskbar. Otherwise no settings are saved. I still prefer WordWeb, and the built-in online searches work just fine there. I have version 4.0.1774 on my flash drive. This is a good freeware dictionary along with Wordweb.Thank you for the authors who developed this. I suspect a separate entry for the 3x version will be needed as it supports only Windows XP, and Vista. 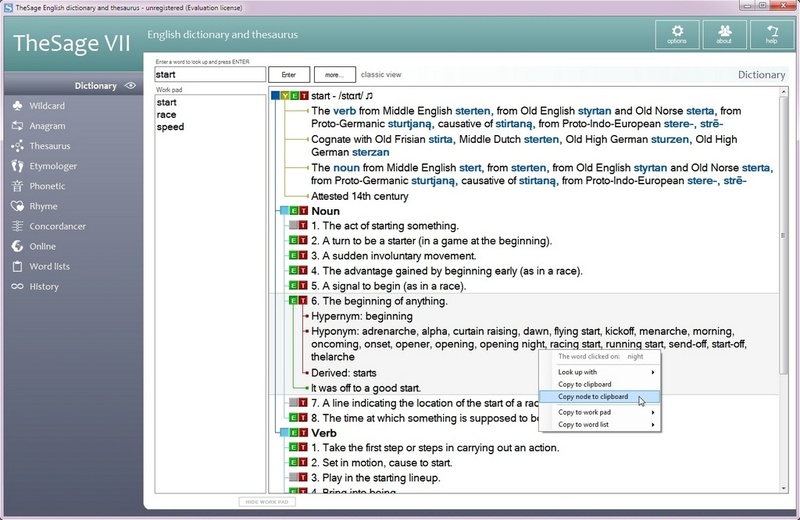 TheSage Dictionary and also the YadaByte Dictionary, are both excellent. They are great to use alongside pretty much any Text Editor or Word processor. I've been in touch with the publishers who are basically saying that they are working on an updated database file so 'Watch This Space',keep an eye on their web site for updates. Hank7, I have been using TheSage from a usb since its first release and have not had a single problem. While installing TheSage there is a dialog window which says something like "TheSage is being customized for optimal performance on your system". Does anyone know more about this? Is the portability affected?